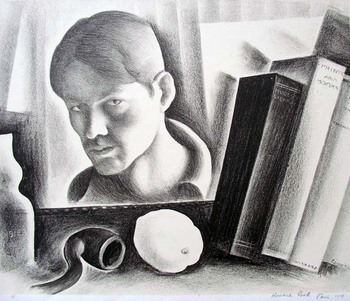 Biographies for the American artist Howard Cook often repeat the note that he was commissioned by The Forum magazine to go to New Mexico and create illustrations for Willa Cather’s novel Death Comes for the Archbishop. During the 1920s, Forum regularly published portfolios of prints by contemporary artists. The magazine printed a series of Cook’s prints made during a trip to Maine in 1926 and the following year, three other groups of prints made in New Mexico. 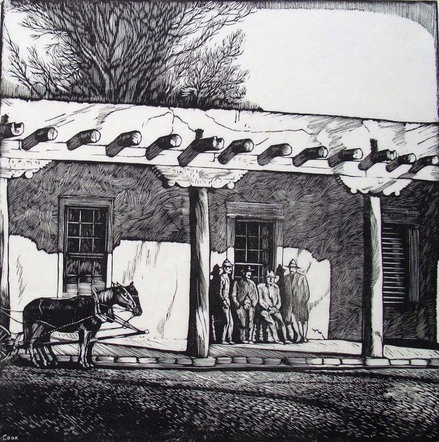 Our print, seen above, was part of ‘Dobe and Pueblo in Santa Fe - Wood and Linoleum Cuts printed in the March 1927 issue. 1927 was also the year that Forum serialized Cather’s novel from January to June. Her illustrator was Harold von Schmidt (1893-1982), who went on to create additional prints for the edition of Death Comes for the Archbishop organized and designed by Elmer Adler for Knopf.